Don't forget to download our free software for writers! Inner Journey is an e-mail course designed to take you to an incredible journey within your self, while giving you an eagle's eye view of the world outside. Modules are sent 3 days a week...Tuesday, Wednesday and Thursday. Each module is a gentle push for you to think and feel more deeply; write more honestly. You'll look forward to spending those precious 15 minutes on creatively and purposefully nurturing the writer and person inside you every week. Inner Journey Springboard - receive 18 modules (6 weeks) for $12. You'll also receive an elegantly designed .PDF compilation of all modules plus 3 more (a total of 21 Inner Journey modules). You can print out each page and paste it in your journal. Inner Journey Complete - receive all 36 modules (12 weeks) for $20. You'll also receive an elegantly designed .PDF compilation of all modules plus 16 more (a total of 52 Inner Journey modules - a year's worth if you do one module per week). Sign up for Inner Journey Complete right now and you'll receive a complimentary print copy of the course. Even if you intend to take Inner Journey Springboard or Inner Journey Complete, you'll begin with the Inner Journey Dip. It's our no-obligation test drive. 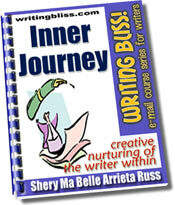 All writers receive the same first 6 modules. To continue the Inner Journey course, an e-mail containing payment information is sent on Friday, a day after you receive the Inner Journey Module 6. Once we receive notification of payment, you'll continue receiving Inner Journey modules. If you don't wish to continue, you simply do nothing. If this is your first time to take a course in the WritingBliss!™ Series, take a look at our testimonial page and read what writers are saying about our courses. Important: You must provide your real/full name and not initials in order to complete your registration. Attention writers with AOL.com, CS.com and Email.com (and its variants - e.g., cheerful.com, exec.com) addresses: These companies are filtering e-mails without your knowledge. Therefore, if you wish to register in any of the writing courses in this site, do not use these e-mail addresses to sign up. You will not receive the modules or you will receive incomplete modules. This is beyond me so please use a different e-mail address. Attention writers with Hotmail.com and Yahoo.com addresses: Make sure you set your e-mail preferences to accept e-mail from shery@writersonthe.net or else the modules will go straight to your Trash folder or your Spam folder. Attention writers with an Earthlink.net e-mail address: Earthlink uses spamBlocker so make sure you put shery@writersonthe.net in your whitelist or your list of allowed senders before you sign up for this course. Otherwise, you will not receive the modules! I simply cannot click a link and verify myself to Earthlink.net's system every time an Earthlink user signs up for my courses. Registration for Inner Journey Complete is open. You may begin the course on Tuesday following receipt of payment. of this course will be mailed to you. To begin this course, click the PayPal button below. Once your payment is received, you'll receive a confirmation e-mail from us within 24 hours. Your first module will be delivered to you this coming Tuesday. will also be mailed to you. My new book, The Journaling Life: 21 Types of Journals You Can Create to Express Yourself and Record Pieces of Your Life, is now available! Head on to TheJournalingLife.com for more info and to order (opens a new window). 10% off today. Bonus gift + FREE shipping anywhere in the US!